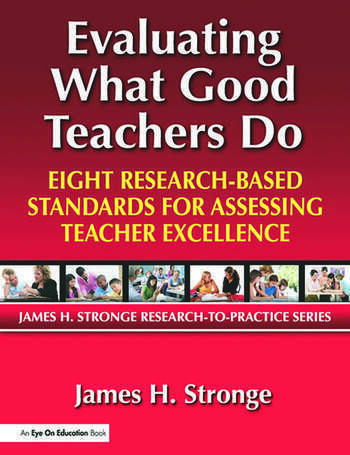 This book is based on author James H. Stronge's 20-plus years of consulting with school districts and other educational organizations in designing, piloting, and training educators in the use of teacher-performance evaluation systems. Its primary purpose is to help both teachers and their evaluators collect more comprehensive and accurate assessment data for judging teacher effectiveness. The author provides field-tested teacher-evaluation systems based on performance standards which include data collection tools and performance appraisal rubrics. What Are Teacher Performance Standards and How Are They Used? What Does Professional Knowledge Mean? What Does the Research Say About Professional Knowledge of the Teacher? What Are Research-Based Quality Indicators for Professional Knowledge? What Does Data-Driven Planning Mean? What Does the Research Say About Data-Driven Planning? What Are Research-Based Quality Indicators for Data-Driven Panning? What Does Instructional Delivery Mean? What Does the Research Say About Instructional Delivery? What Are Research-Based Quality Indicators for Instructional Delivery? What Does Assessment for Learning Mean? What Does the Research Say About Assessment for Learning? What Are Research-Based Quality Indicators for Assessment? What Does Learning Environment Mean? What Does the Research Say About Learning Environment? What Are Research-Based Quality Indicators for Learning Environment? What Does Communication and Advocacy Mean? What Does the Research Say About Communication and Advocacy? What Are Research-Based Quality Indicators for Communication and Advocacy? What Does the Research Say About Professionalism of the Teacher? What Are Research-Based Quality Indicators for Professionalism? What Does Student Progress Mean? What Does the Research Say About Student Progress? What Are Research-Based Quality Indicators for Student Progress? Evaluating Teacher Effectiveness. How Can We Make a Difference?